I don't mean this website is known. If that were the case, I'd probably be making a living off of ad revenue or more book sales. Rather, the platform on which this website is built is called Known, co-founded by Ben Werdmuller. 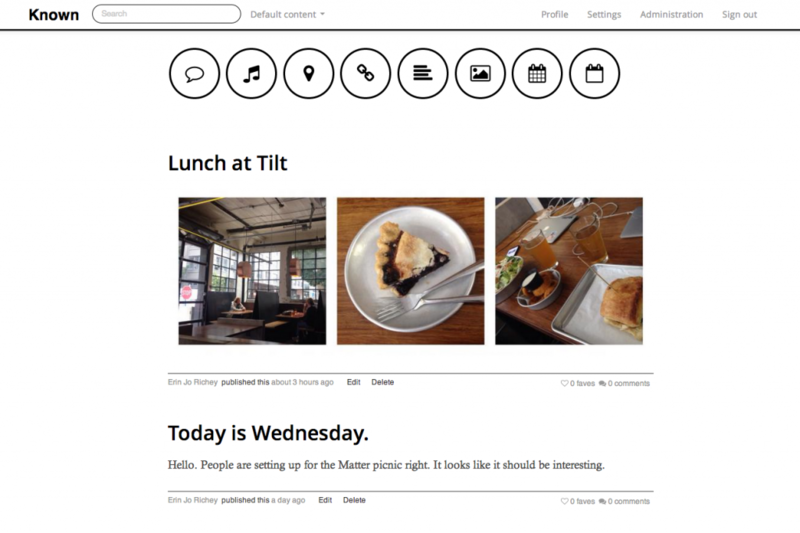 Like WordPress, Known allows website owners to post their content in a feed. But one of Ben's goals with the platform is to enable content owners to keep their content without the risk of losing it to a corporate shutdown a la Geocities in 2009 or MySpace Blog in 2013. He and other independent web pioneers breathe life into IndieWeb.org, a website and community aimed at promoting independent web content ownership everywhere. Why use Known to blog instead of WordPress? The interface is extremely simple. Installation, as easy as WordPress; maybe even easier. Some webhosting services offer one-click installation, like WordPress. Standard installation, however, is still simple even for novice developers: Create a database, unpack the Known zip file in your web server's root or designated directory, and then visit your domain or directory on the domain. Known walks users through the set up process, also like WordPress. Posting is done right on the main page with a WYSIWYG panel. No Dashboard visits to post. Look and feel can be edited through the Site Configuration portal with functions appearing on separate pages. Site configuration is a little more friendly for the less tech-savvy user than WordPress. On WordPress it's very easy to break the site since WordPress enables PHP edits to templates' core files from its dashboard. Fine for developers; not fine for non-developers. With Known, users must know how to access the server in order to mess with templates. Also like WordPress, Known is open-source. Improvement and development of plug-ins, themes, and core files is welcome as long as developers follow coding standards and guidelines. Perhaps best of all, Known is young and Ben and other developers involved in the project are reachable by email. Maybe not for long though. But isn't that true for all great developments? Well, I'm still trying to figure out if Known is great. So far, so good. I prefer black, grays, and darker backgrounds and have tended to make the margins of my webpages black in the past. Cuts down energy use. For the sake of time, I've made minimal changes to this theme's CSS, just enough for me to be happy to publish. I do have the ability to make more drastic style changes, but I prefer to keep it simple.